If you’re ever in Clemson, SC on a Thursday, Friday, or Saturday do yourself a favor and stop and eat at Loose Change. 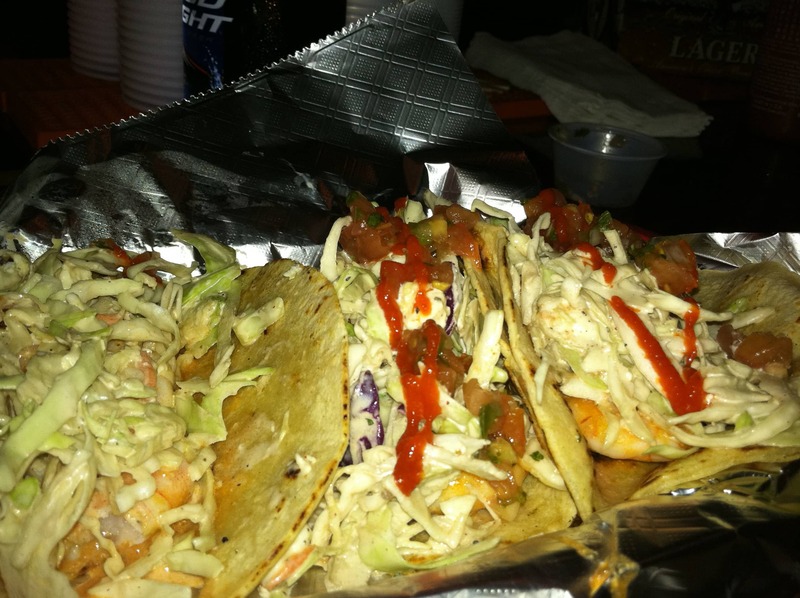 It is a hole in the wall bar that is serving up top notch, amazing food. Chris Fuller and his wife Carrie are the owners and Chris makes simple, yummy eats. He uses fresh ingredients and everything is made to order. As a Clemson University student, I eat there at least twice a week. I honestly do not know why anyone would go and eat lesser Sysco provided bar food from one of the local restaurants/bars. The Fullers serve their food directly from the heart and with passion. Plus, they’re good people and have a great music selection to listen to while you inhale their delicious food. Their tacos are great! The key to their awesomeness is the simplicity. Fresh diced jalapenos, cilantro and red onions garnish a simple grilled chicken (or beef or steak), served with a small, toasted corn tortilla with a little cheddar and Monterey jack cheese with a side of Pico de Gallo. It reminds me of street food in Mexico. Top it off with a little Sirracha sauce and you’ve got yourself a spicy, flavor-popping treat! Chris makes a wide variety of Mexican dishes, but my favorite dishes outside of the Mexican fare are his chicken salad and his BBQ. Every Friday for lunch Chris smokes several Boston Butts and serves them up with his very own special blends of spices and sauces. It is amazing. The smoky flavor of the pork really shines through and the sauce proportion never hides the true taste of the pork. In addition to an amazing selection of dishes, their sides are as equally impressive. Hand cut fries and potato chips are the fan favorites. Just ask for the malted vinegar on the side and you’re all set. Do yourself a favor and get Chris’s Loaded Potato salad – it is rock solid. It showcases the potato and isn’t drowned out by mayonnaise and other frivolous flavors. Just like the potato salad, the chicken salad showcases the chicken and is served on Ciabatta bread with lettuce, tomato and cheese. It has cranberries, pecans, and celery and is delicious! I love finding small, locally owned businesses trying to bring a higher standard of food to the public. Chris loves food and it shows. The prices are very affordable and you completely get your money’s worth. The staff is super friendly and attractive (if you’re a guy, or a lesbian). The music selection is good ol’ rock & roll, with some modern hits from Kings of Leon and The Black Keys. I don’t go too many other places to get my hunger fix and I suggest you do the same. Come visit Chris and Carrie and tell them that Jay sent you. They know me…and yes, this is a biased report.